White paper on crime 2001 Part4/Chap.4/1. As for the numbers of cleared cases and persons cleared for penal code offences except for professional negligence in traffic accidents allegedly committed by foreign nationals, both numbers for established residents (i. e. permanent residents)have been on a downward trend for a long time. In contrast, cleared cases and persons cleared for above offenses committed by visiting foreign nationals (all foreign nationals staying in Japan except for established residents, those connected with the U. S. forces serving in Japan and those whose status in Japan is unknown)significantly increased about 26-fold from 867 cases in 1980 to 22,947 cases in 2000 and about 8-fold from 782 persons in 1980 to 6,329 persons in 2000. 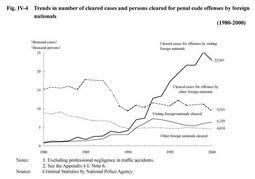 The number of persons referred for special offenses except for violation of traffic-related laws such as road traffic violations allegedly committed by visiting foreign nationals also increased about threefold from 2,280 in 1980 to 6,382 in 2000. 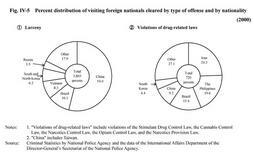 By examining major offenses, the trend of the number of cleared cases for larceny allegedly committed by visiting foreign nationals increased sharply in 1993, and generally an upward trend followed. However, the number decreased in 2000,falling by 10.9% to 19,952 over the previous year. By nationality, more than half of those cleared were Chinese. The number of cases cleared for Immigration Control Law violations has been decreasing after having peaked in 1997. In 2000, the total number of cleared cases was 5,862, in which the number of illegal stay was 3,111, followed by cases such as not carrying a passport (1,725 cases). The number of persons cleared for smuggling immigrants in groups reached 1,360 in 1997, but has decreased since then, down to 103 in 2000. The number of cleared cases of violations of drug-related laws was 1,051 in 2000, staying within the range of 1,000 to 1,200 after the sharp rise in 1992. By nationality, Iran was about one-fourth of the total cleared persons, followed by the Philippines and Brazilin that order.